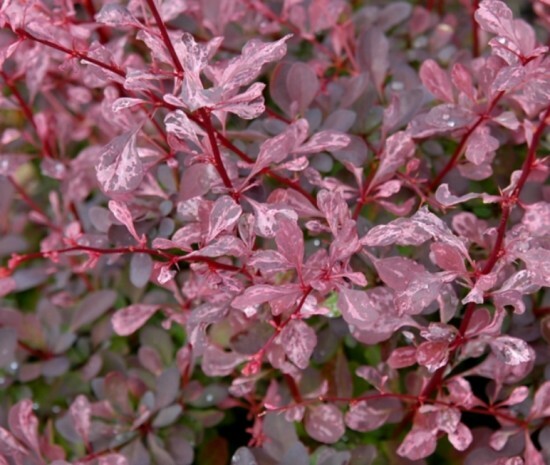 Rose Glow Barberry is an easy to grow and very versatile shrub. 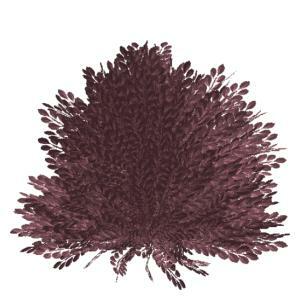 With its eye catching colour it is excellent for foundation, border, or mass plantings. It is a vigorous and showy cultivar with variegated leaves of purple with light pink splotches and vibrant red fall colour. Miniature yellow flowers in tiny clusters beginning appear in early April, lasting into the end of May. Long bright red, oval shaped seed pods follow and persist into the winter. Barberries can adapt to many different soil types but do require well drained soil. Once established they can tolerate mild drought conditions. 'Rosy Glow' prefers full sun but will also grow in part shade. In part shade the colors of the bush will fade to an almost solid green color with red and pink accents.